This post is a sponsored collaboration between Doorman and Gothamist staff. Sign up now and get $10 off with code SFIST! Honestly, one of the worst things about apartment living is the mystery of package delivery. What if I'm not home when it comes? Will a neighbor buzz in the delivery person? If not, will they leave it on the sidewalk like a monster? Will my things get stolen if they sit in the lobby all day? Will I get fired if I work from home? If so, will I get assaulted if I bring a huge box on the rush-hour BART? Really, it never ends. Don't end up like my colleague who missed her wedding dress delivery, re-routed it to the office, then lugged it all the way home—both are problems that Doorman could have solved. Finally, a service app that actually solves a problem. 1. You order something online, but have it shipped to the Doorman depot instead of your home. 2. Doorman receives the package and sends you a notification through the app. 3. You schedule when you'd like this package delivered to your home, any day of the week until midnight. 4. Your package begins its journey home, and you receive a notification when the driver is a few minutes away. 5. The delivery person rings your buzzer and hands over your goods. I had the chance to try out the service, and I have to say it was awesome. The app itself was breezy to use, showing pending shipments, their statuses, and expected delivery times. It's going to be especially useful soon, when we're all ordering tons of gifts for the holidays. I even had something sent late-night so I could hide it from my sleeping SO, who is still none-the-wiser. You can also set up packages to be held at the depot and delivered all at once, which, in my opinion, is one of the coolest things about the service. What's better is if you're ordering perishables or you have one of those insanely popular meal subscriptions, the depot is climate-controlled. No more imported cheeses languishing in a humid shipping facility all day. 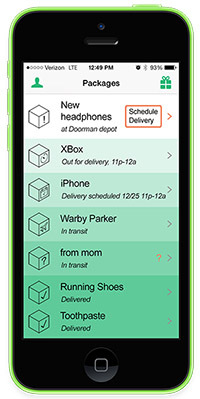 Doorman has three tiers of service: Tier 1 offers one-off deliveries for $3.99 per package; Tier 2 offers unlimited deliveries with 2-hour windows at $19/month; Tier 3 offers unlimited deliveries with 1-hour windows and unlimited package returns for $29/month. Delivery 7 days a week. Combine multiple shipments into one delivery. Constant updates on delivery status. Free returns with the Tier 3 subscription. No more missed-delivery door tags laughing in your face. And no more lugging boxes home from the office. Ready to check it out? Check out more info at Doorman.it or download the app for iPhone or Android. They're also offering a special deal for SFist readers: sign up now with code SFIST and get $10 off!